My Castle on a Cloud: Giveaways at P&P 95' !! Giveaways at P&P 95' !! So the giveaways are here! 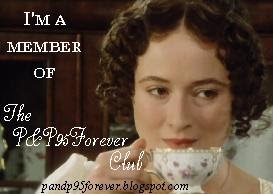 If you are a member of the P&P 95 Forever Club pop over and have a look at the sweet things they have on offer! They have a mug, bookmarks, a cute necklace pendant and a pretty keyring! And extra cool.....they have a pretty bookmark especially for those of us (like me) who live in aussie/nz. Thankyou so much P&P 95 Forever Club!